There are recipes we try and love once or twice, and a few that make it into our longtime dinner rotation. And then there are recipes that we make, love, and immediately turn into staples. For me, this mustardy lentil and sweet potato salad/dip/spread is the latter. It’s so simple and easy to prepare, but it’s a combination of a ton of my favorite flavors and textures in one place. 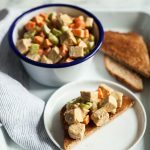 It’s filling, nutritious, and versatile, something that can be scooped onto a bowl or salad, spread on toast, served with crackers, etc. The sauce on this salad is an enticing mixture of tahini, Dijon mustard, tamari, lime juice, and a touch of maple syrup. It’s good enough to make and serve in lots of different ways, from grain bowls to kale salads, but it’s particularly good here. 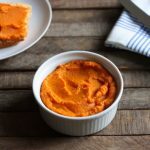 Its slight sweetness picks up the the sweetness of the sweet potatoes, but the mustard and garlic give it all a little bite–as does the addition of fresh herbs to the salad itself. Make a batch at the start of the week, and enjoy it for lunch or breakfast for the next few days. It would be great in wraps, stuffed into collard leaves, scooped onto salad or a bed of quinoa, or as a snack-time dipper for crackers. To save some time, you could bake or steam the sweet potatoes in advance. I baked them, so that they’d be a little creamy and tender for the salad; steaming them will allow them to hold their shape in the salad more. Here’s the recipe! To bake the sweet potatoes, preheat your oven to 400F and prick them a few times with a fork. Bake for 35-40 minutes, or until they're tender all the way through. Remove them from heat and allow them to cool, so that you can handle them easily. Scoop the flesh out of the skins and chop it into ½-inch cubes. To steam the sweet potatoes, peel and chop them into ½-inch cubes. Place a steamer attachment over a large pot of boiling water. Steam the potatoes for 15-20 minutes, or until they're very tender. Set them aside. Rinse the lentils and place them in a small pot with enough water to cover them by a few inches. Bring them to a boil and reduce them to a simmer. Simmer for 25 minutes, or until they're tender but firm when you taste them. Drain them. Transfer the sweet potatoes and lentils to a large mixing bowl. Whisk together the garlic, tahini, mustard, tamari, lime juice, maple syrup, and red pepper, along with 1 tablespoon water. Pour this mixture over the sweet potato and lentils. Add the green onion, parsley, or other fresh herbs. Fold everything together. Check for seasoning and add extra lime juice, mustard, or tamari to taste. Serve. Leftovers will keep in an airtight container in the fridge for up to 4 days. This recipe is packed with nutrition, including protein, Vitamin A, Vitamin C, tons of fiber, and a good deal of iron as well. More importantly, it’s flavorful and lovely without being too fussy. I hope you’ll enjoy it. Thanks for the many sweet words about the upcoming Food52 book. Can’t wait to share more. Have a great evening, and I’ll return with another legume recipe later this week! Funny, Maria — when I moved back home last summer, I spent pretty much my whole first month back eating various forms of toast, because they were so easy and versatile and comforting. I hope you enjoy the recipe! Your salad looks absolutely delicious. I can’t wait to try this! I love all forms of potato, especially sweet potato because of its sweet deliciousness and also because it’s low GI. I am also very partial to potatoes, and sweet potatoes are my favorites (clearly, since I make recipes so often with them on the blog!). Hope you enjoy it when you try it, Jennifer! So many of my favorite flavors here…mustard! lime! sweet potato! maple syrup! Sounds delicious!! This looks wonderful, thanks! Love mustard with tahini and you can never go wrong with lentils! 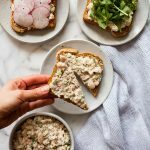 What beautiful photos of an amazing recipe! Looks delicious, I love the addition of the lentils.. yum!! I love the sound of this salad! +100 to making a huge batch and eating it all week long, especially while it’s super hot outside. I bet it would also be excellent in a lavash wrap with a bunch of fresh greens. How is this raw when the potatoes and lentils are cooked? I’m just researching raw diets for the first time so confused. This looks like proper comfort food- delicious! This looks so nice. I can.t wait to try it this weekend. Will let you know how it goes. That looks like extreme comfort food, like a highly improved beans on toast! I have been on a mustard and tahini kick lately, so this is going to happen in my kitchen soon I hope. Ha! I think it’s a totally addictive recipe, too, Arlene. Glad you liked it, and I hope it’s a hit! Mmmm…. I love the idea of these flavors combined together. I just made this for lunch and added dried cranberries and finely chopped kale it was heaven! I made this yesterday, and it is so completely gorgeous and delicious, that those 6 servings were consumed by just two (admittedly very hungry!) people! I think this is definitely going to become one of our meal-time staples too! I’m already making it again this week, Rachel! So glad you liked it. I just finished my first batch of this and now I want to make it again. I subbed black beans for the lentils, and chipotle for the mustard. Served with rice, kale + avocado. Could have this almost every day! This looks delicious and I’m adding it to my menu for next week. Do you think this would freeze well? Now this is a nice way to mix up the standard potato salad. Lentils and sweet potatoes do go well together! Just started a BSN program and I love your recipes (esp. the quick nutrient dense ones 🙂 Put this on celery sticks with a couple raisins and brought them in my lunch today. So tasty! I’ve been enjoying this dish. I’ve had it over greens, with quinoa, and with rice…very versatile! Love that it’s oil-free!! Thanks so much. I used to prepare this delicious recipe to my kids. Unbelievably delicious! Thank you for this recipe. i did not have tahini so subed ov+cumin. Will make again with tahini. Going for a second serving. Yum Yum. This is a classic to me! 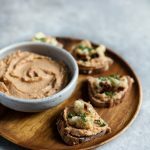 I love this recipe and make it all the time since your mention this summer – sometimes with Justin’s maple almond butter or some cashew butter and a dash of sesame oil when I’m out of tahini, sometimes with Japanese sweet potato, and sometimes with pumpkin purée. Once I didn’t have enough dry brown lentils, so I threw in some red lentils. It’s great! I eat it on no-knead bread or romaine. Thanks, Gena.